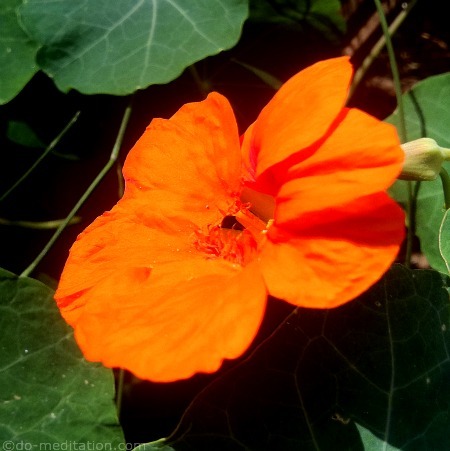 Use this passion chakra guided meditation for activating your sacral chakra. This is also the second chakra in your body that governs your creative impulses. With its element as Water, it signifies your 'seat-of-self' or swadhishthana (Sanskrit name for the chakra). Take a long and deep breath. As you exhale, move attention to the lower part of your abdomen, below the navel, and imagine a glowing orange chakra. The orange glow of the chakra spreads to the rest of your body like ripples on the surface of water. You feel it like the ebb and flow of gentle waves hitting the shore of your body. Imagine standing on a pristine, white-sand beach, and it is just before dawn. The sky is streaked with orange in eager anticipation of the sun. Watch the sky. Now look down at the infinite expanse of gentle surf and calm water in front of you. Step forward and dip your toes into the warm water of the ocean. Notice how it slowly approaches, laps around your feet, and then returns to its source. You move forward and now the waves caress your knees and thighs. The water is crystal clear and you can see the white sandy floor under your feet. You dive into the water and start swimming effortlessly. You turn and ease onto your back and start floating like a weightless leaf. You gaze at the orange sky while moving and flowing with the waves. Now see your second chakra spinning and gaining strength. As it spins faster, an orange light washes over you and pervades every cell, every pore in your body. Breathe deeply and feel the energy funneling down your spine to the second chakra. Gently turn to start swimming again. You realize that the sea has safely carried you back to the shore so your feet find the sand and you start walking out of the water. Look back at the sea and feel one with it. A free passion chakra guided meditation mp3 for download is a work-in-progress and will be put up on the site soon. Until then, I hope the guided meditation script above serves you well. Also, click on second chakra meditation to learn three meditation techniques on how to open and balance your sacral or passion chakra.